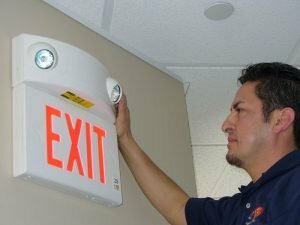 When emergencies strike, public safety demands the proper operation of emergency lighting and power products to assure orderly egress. When emergencies strike, public safety demands the proper operation of emergency lighting and power products to assure orderly egress. Ensuring full protection means our life safety products must perform reliably, on demand, without question. It’s an unyielding standard Dual-Lite sets for itself…one that has resulted in millions of trouble-free hours of operation. Innovative designs that deliver energy-savings and aesthetics at every turn. Whether your application demands sleek lines and a low-profile silhouette or rugged durability, Dual-Lite offers the perfect solution for every commercial, industrial or institutional application. High quality, high performance components, easy installation and innovative, energy-conscious engineering ensure long-life, worry-free operation and lower maintenance. 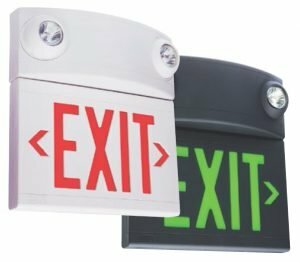 Two distinct concepts drive Dual-Lite’s exit sign lineup, offering exit signs and emergency lighting that create a unified look. Application: The LX Series offers bright and even LED EXIT panel illumination with Green or Red letters and attractive UV stable thermo-plastic housing. Features include AC or Emergency operation with optional Spectron® self-test/self diagnostic circuitry. Housing designed for quick and easy installation with low energy consumption. Damp location listed. Accepts 120 or 277 VAC input. Construction: The precision-molded thermoplastic housing is impact resistant and scratch resistant, corrosion proof and UL stabilized to resist discoloration. Available in white or black finish. Innovative snap-together design. Includes additional face-plate for single or double face applications. Snap-in directional chevrons. Exit stencil with 6” letters and ¾” stroke. Includes push-in wire connectors for easy installation. Installation: Universal mounting (ceiling, end, wall) to standard 3-½” or 4″ octagon or square electrical box by use of easily removed, template configured knockouts. Canopy and universal mounting plate included. All mounting hardware is fully concealed. Illumination: Exit face illumination is provided by energy saving, long-life red or green LED’s. Exceeds UL 924 requirements for brightness and uniformity. UL listed LED run-time of 120 minutes. 10 year LED life. 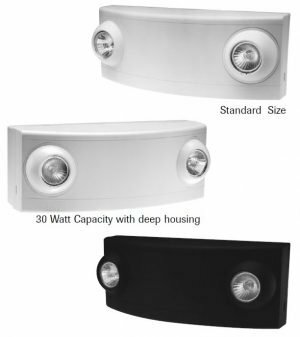 Application: The LT Series provides bright, even LED exit illumination and emergency lighting, offering a flexible solution for emergency path of egress illumination. 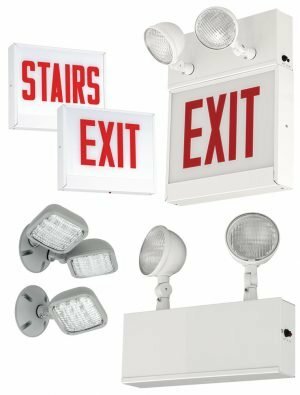 Four long life LEDs illuminate the exit sign, and two, semirecessed “eyeball” shaped lamp-heads with halogen or LED based MR16 lamps provide emergency unit illumination. Remote capacity and damp location options are available. Construction: The precision-molded thermoplastic housing is impact and scratch resistant, corrosion proof and UV stabilized to resist discoloration. Available in white or black. Innovative snap-together design. Includes additional face-plate for single or double-face applications. Snap-in directional chevrons. Designed for ceiling or wall mounting; can be end-mounted with end-mount accessory kit. 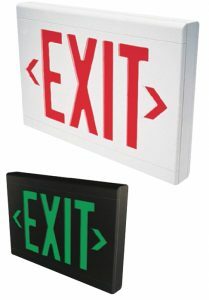 Red or green polystyrene .030″ diffuser is frequency matched to the LEDs providing optimum exit sign illumination. Installation: Product mounts to 3½”, 4″ octagon or 4″ square outlet boxes. Housing back-plate includes universal knock-out pattern for outlet box mounting. Keyholes provided for securing housing to wall surface. Prestripped pigtail leads provided. Illumination: Four long-life LEDs provide exit illumination. Exceeds the 2009 UL 924 requirements for brightness and uniformity. Unit illumination by halogen or optional high-performance LED based MR16 lamps. Application: The HCX Series provides bright, even LED Exit illumination in an attractive housing, designed for quick and easy installation. Available with or with-out fully adjustable MR16 Halogen lamps and remote capacity option. Remote capacity option;12 watts (with integral lampheads), 23 watts (without lamps). Optional LED based MR-16 lamps available for increased coverage and additional remote capacity. Construction: Precision-molded thermoplastic housing and lamp-heads are impact and scratch resistant, corrosion proof and UV stabilized material to resist discoloration. Available in white or black with a light texture. Innovative snap-together design optimizes installation time. Includes additional face-plate for single or double-face application. Snap-in directional chevrons. Includes canopy and universal mounting plate for end,, ceiling or wall mounting. 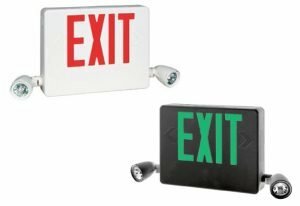 Red or green polystyrene .030″ diffuser is frequency matched to the LEDs providing optimum exit sign illumination. Installation: Sign mounts to 3-½”, 4″ octagon, or square outlet boxes and standard plaster rings. Back-plate provides a knock-out pattern for mounting to outlet box. Mounting canopy provided with all models. Canopy mounts to outlet boxes by means of a mounting plate supplied. Exit housing snaps to canopy. Pre-stripped pigtail leads provided. Push-in wire connectors supplied for making AC connections. All wiring dresses into formed wire-ways in housing.